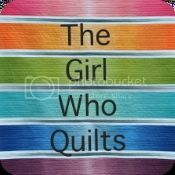 In an effort to challenge myself in my quilty life and connect with more quilting friends, I've decided to start a monthly personal challenge + linky party! To join in, write a blog post (or include the info in a flickr photo description if you don't blog) about your own challenge for February (quilting/sewing/fabric/design related, please!) and include my blog button in your post. Next link up here! Stop back in the beginning of March to report on your February challenge and start something new for March! I will visit each participant's blog/flickr, and I can't wait to learn more about all of you! After you link up, take a few minutes to stop by other blogs to see what we are all up to! My February challenge is to go outside of my comfort zone and meet more people at QuiltCon. I'm very much an introvert, but I will be so disappointed if I don't put myself out there! Now it's your turn! What's your February challenge? Grab my button and add it to your own February Challenge post! Link ups are open until midnight of February 5th. (In the future, link ups will only stay open until the 3rd of the month). Don't forget to stop back at the end of the month! I will randomly choose 1 link up participant on February 6th. That person will receive a PDF copy of my 9-Patch Puzzle Quilt Pattern and a set of 42 - 10" squares in the solids that I used for the cover quilt!